It’s been a tough few days. What with the man going under the knife for his minor op et al. First, he wouldn’t touch the codeine claiming it made him uncharacteristically calm. Then, persuaded of its wide healing properties, he insisted on overdosing on it until I hid it from view. I briefly toyed with the idea of hitting him on the head with a saucepan. Or strangling him with the cord on my coffee grinder. But then I thought about going without cigarettes, alcohol, hot food or fresh air for seven days. Dire came to mind. I gave him plenty of the next best thing instead. Chocolate. Ironically, this recipe for soft Pistachio and Cardamom Brownies came from another bunch of ladies in despair. The Indian Summer special in the June issue of Fresh Magazine featured them in summer picnic best, braving freezing British weather in the park. These brownies are sinfully squidgy, bursting with flavour and totally divine. Sometimes, it takes more than a bit of discomfort to experience something wonderful. Preheat the oven to 180 Degree C (160 for fan assisted). In a large microwaveable bowl, break the chocolate pieces and cube the butter. Stick it in on medium heat for three minutes until lumpy but melted. Crush the cardamom with the whole vanilla in a coffee grinder or pestle and mortar. Add this to the bowl and mix thoroughly until smooth. Now, lightly beat the eggs and stir them into the chocolate along with the sugar. Then fold in the flour and the peeled pistachio nuts gently. I used salted pistachios, which I shelled myself. If you used the shelled, unsalted variety add a pinch of salt to the batter. Take a rectangular /square baking dish that is at least an inch deep. The original recipe asks for a cake tin lined with parchment paper, but I clearly don’t bake enough. I just took some margarine out of the fridge and rubbed it evenly across the base and sides of the baking dish. Then I tipped the batter in and baked the whole lot for 30 minutes. After 30 minutes, take the dish out of the oven, leave to cool and then refrigerate for two hours until set. Cut into rectangular pieces and enjoy on their own or with Vanilla ice cream. OHO!! I bet they are sinful after all that dark chocolate, my kids would literally flip for those!! Cardamom with chocolate – of course! It’s a match made in heaven. I can’t wait to taste this divine pairing. I’ve added cardamom to my brownies for a couple years now. I also like to add cinnamon! I will try this recipe for sure though! Those have turned out amazing – and cardamom with chocolate is something I am yet to try! I did not know abt the chilling trick…I only have an oil-based brownie recipe which is very quick but doesn’t look as chewy as yours, so am going to try yours soon! Great to see good & yummy sense prevailed (over despair & saucepans!!)! 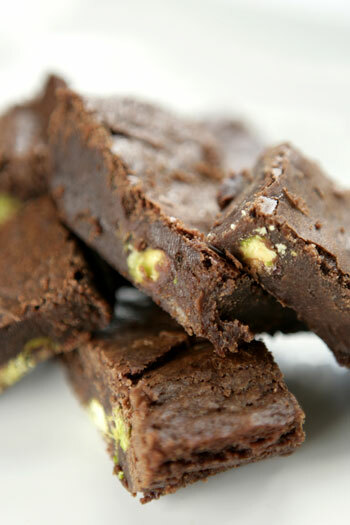 Chocolate & pistachios are a great combination. My 12 yr old daughter made a Nigella choc-pista fudge a while ago…nirvana it was!! Cardamom is a new twist to the tale..hmmmmm; sounds good to me!! This is total heaven! I am soooo making these and SOON. What a brilliant combination! This recipe is a must-try. You have a lovely blog Mallika. nothing like a bit of chocy to make everything ok and pistachio chocolate is a heavenly combo. Inspired by Deeba, I made its fudgy avtaar..was sublime! lol healing with chocolate – what a great idea! lovely brownies! Ayyo – true love means never having to put the saucepan down ;-D Can’t go wrong with chocolate! made this the day before yesterday and they are lovely! easy to throw together (although peeling the nuts proved tricky) and how do you pestle and morter cardomen pods? i ended up cutting them with scissors!!! still…great brownies – will be making again!!! sounds great to me…thanks for stopping by Cooking Chat, it has been awhile in both directions! Hi Cat… you crazy thing, you! I can’t believe you peeled the nuts! And cut cardamom pods with scissors! You just need to shell the pistachios. And the cardamom pods are de-seeded anyway. You just squash them with the flat side of a knife, extract the seeds and crush them super simply. What a wonderful flavor combination for brownies. After reading your comment on my post, I headed right over here to see the recipe. I love using fresh ground cardamom. Hi Mallika…Found you and this site accidentally yesterday, but looks like I am going to be totally hooked onto this one! Planning on making these celestial looking brownies soon however I am a little confused. Does this recipe call for ground cardamom seeds or is it the whole pods minus the seeds? Seen as you mentioned using a grinder or mortar and pestle, I am assuming it’s the former. Hi Kirtee – Great to hear that you found QIC. The recipe calls for ground cardamom seeds. Try them and you won’t be disappointed. Hi again – Thanks for your response, Mallika. Tried them out promptly last night. My hub unit took some brownies to work this morning and is going to share them with his colleagues. Now this can mean only one thing – that they have turned out pretty good! :-) A thank you is in order for you and I will be trying other recipes on this site for sure. Ooh, these look yummy! I’m studying for my doctoral qualifiers these days, so I crave sugar 24×7. I think I know where my next sugar hit is coming from… Thank you, Mallika! You were right. These are sinful! Quick question though. I baked them for 30 mins, however the batter was still wobbly in the middle, so I put it back in for about 10 mins. This made the edges all hard and crumbly and basically inedible. Any ideas what I’m doing wrong? Thanks Mallika. I finally got these right this weekend. 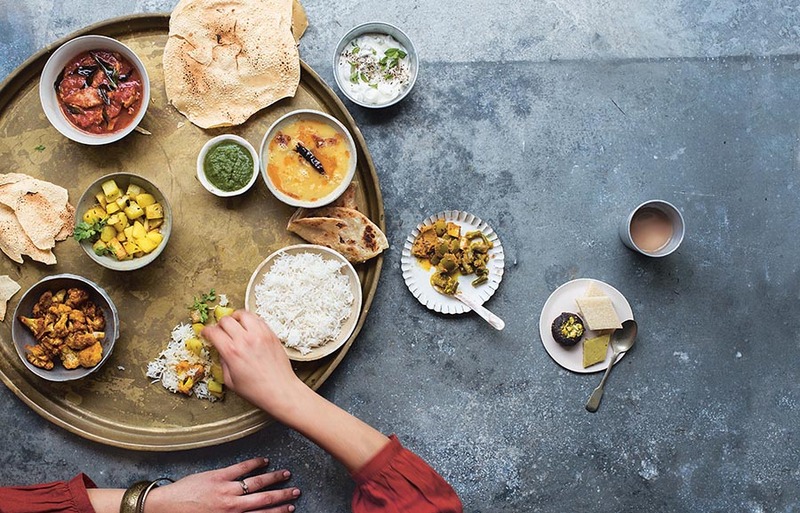 This recipe looks absolutely divine and I’m sorely tempted to give it a go today. One question, though. Is self-rising flour absolutely necessary or will ordinary all-purpose flour work in its place? I’ve never heard of self-rising flour being used in this way and was curious about the rationale. Just wondering do I need to use chocolate or could I also use coco powder? Hi Flo – sure you could cocoa powder, but I’m not really sure how much. Can you make an educated guess… eek! What does gm stand for? Is it for grams? It is indeed Mary, good luck! his website, as here every information is quality based data. approaching post. Thank you one million and please continue the gratifying work. I will be back to read more, Please do keep up the excellent work.